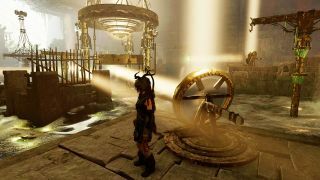 There are a few challenging puzzles in Shadow of the Tomb Raider, but this is the one that had me stumped for the longest. It consists of a room with four mirrors, which can all be turned to redirect light from above onto green nodes on various pieces of equipment. There’s a contraption in the middle with a platform that goes up or down depending on which of its nodes are lit, and scaffolds that link the four mirrors and need to be turned in order for you to climb across them. Turn 2 to the diagonal node and cross back to 1. Turn 1 to the node on the right and cross both to 3. Cross and turn 2 to the same node you just lit with 1. Cross back to 1. Turn 1 diagonally across the room onto the far node on the left hand side to make the second half of your bridge to 4. Cross back to 2 and turn it to the node on its immediate left. Cross to 4 and turn it onto the node in front of it which lowers the central platform and completes the bridge to the prize. Don’t forget to examine the mural here! Go and cross to the prize from the platform in the middle. There - that wasn’t so bad, was it?